This isn’t a movie stunt filmed by some wizards using special effects. 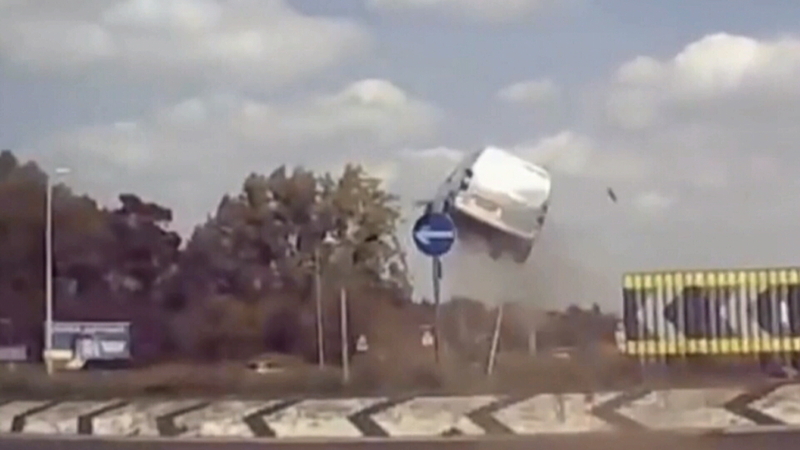 It’s a spectacular crash captured on a helmet cam in one of England’s sleepiest corners. Motorcyclist Andy Daynes was riding his motorbike behind the Citroen van when it approached a roundabout at speed in Attleborough, Norfolk. Instead of slowing down, the vehicle took off and flew through the air. The video has been watched upwards of three million times, but many viewers suspected it was fake. However, Norfolk Police have confirmed the incident is genuine. A spokesman said: "Three people were injured and taken to the Norfolk and Norwich University Hospital. "An investigation into the circumstances surrounding the incident and manner of driving is ongoing."